BATA SHOE MUSEUM - since 1995. 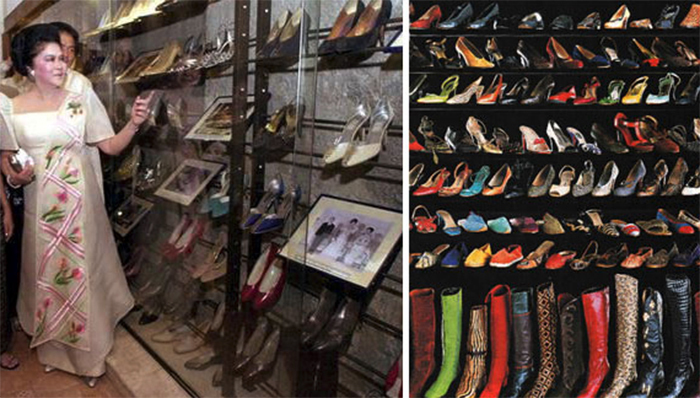 World’s largest - and best - shoe museum (Toronto, Canada). The museum collects, researches, preserves, and exhibits footwear from around the world. It offers four exhibitions, three of which are time-limited; lectures; performances; and family events. The collection contains over 13,500 items from throughout history, as well as the present. It is the only museum in North America dedicated solely to the history of footwear. DUTCH SHOE MUSEUM - Waalwijk, The Netherlands. "In the Dutch Leather & Shoe Museum the shoe industry, contemporary design and technology are brought together. In addition to a permanent collection, the museum also showcases changing exhibits. A visit to the museum will leave you amazed at the versatility of designs and styles of such an everyday item as the shoe." International Wooden Shoe Museum Eelde - museum in Eelde, the Netherlands, for clogs, clog-making equipment and machinery. It has the largest collection of wooden footwear in the world. Museo Rossimoda della calzatura - (Rossimoda Museum of the Shoe) is located in the town of Stra in the Province of Venice, Italy. Northampton Museum and Art Gallery - Northampton, England. The museum has the largest collection of historical footwear in the world, designated as being of international importance. The ground floor is given over to the display of some of the museum's 12,000 shoes, spanning the period from the Ancient Egyptians to the present day. Salvatore Ferragamo Museum - Florence, Italy. Fashion museum dedicated to the life and work of Italian shoe designer Salvatore Ferragamo and his eponymous company. The museum contains 10,000 models of shoes created and owned by Ferragamo from the 1920s until his death in 1960. THE SHOE MUSEUM - Street, Somerset, England. Exhibits shoes dating from the Roman era to the present day. The museum includes the first clogs worn by Gracie Fields and the wedding shoes of Diana, Princess of Wales. TUSPM SHOE MUSEUM - since 1976. At Temple University School of Podiatric Medicine, Philadelphia, Pennsylvania, U.S.A. Includes roughly 900 pairs of shoes, 250 of which are on display on the sixth floor of the TUSPM main building. The displays focus on the question of why people wear shoes. VIRTUAL SHOE MUSEUM - Den Haag, Netherlands. Initiated by Liza Snook in 2004. "The VirtualShoeMuseum aims to present Shoes and its designers in a new and fresh environment, focused on exploration, surprise and awe."